We’d love your help. Let us know what’s wrong with this preview of I Am Rosa Parks by Brad Meltzer. "Kids always search for heroes, so we might as well have a say in it," Brad Meltzer realized, and so he envisioned this friendly, fun approach to biography - for his own kids, and for yours. Each book tells the story of one "We can all be heroes" is the message entertainingly told in this picture-book biography series from #1 New York Times Bestselling author Brad Meltzer. "Kids always search for heroes, so we might as well have a say in it," Brad Meltzer realized, and so he envisioned this friendly, fun approach to biography - for his own kids, and for yours. Each book tells the story of one of America's icons in a vivacious, conversational way that works well for the youngest nonfiction readers, those who aren't quite ready for the Who Was biography series. Each book focuses on a particular character trait that made that role model heroic. For example, Rosa Parks dared to stand up for herself and other African Americans by staying seated, and as a result she helped end public bus segregation and launch the country's Civil Rights Movement. To ask other readers questions about I Am Rosa Parks, please sign up. This book belongs to a series of biographies, and the subjects (at least so far) are drawn in a way that makes them look like kids even when they grow up (their age doesn't seem to change, but other people are represented in adult form). I find it jarring and a little off-putting, but Lena (my 6 year old neighbor) looooooves these books and is very happy with the art as is. This biography isn't doing too much new in terms of kids picture books about Rosa Parks but for its particular cartoon aest This book belongs to a series of biographies, and the subjects (at least so far) are drawn in a way that makes them look like kids even when they grow up (their age doesn't seem to change, but other people are represented in adult form). I find it jarring and a little off-putting, but Lena (my 6 year old neighbor) looooooves these books and is very happy with the art as is. This biography isn't doing too much new in terms of kids picture books about Rosa Parks but for its particular cartoon aesthetic (very cartoony, first person POV, conversational narrative text as well as speech bubbles) and Meltzer's silly humor. It starts out with Rosa as a kid being a bit small for her age and being teased affectionately by her brother. Next she's at a park and gets pushed by a white boy. She pushes him back and stands up to his mother, too, who threatens to have her put in jail. From there, we learn about racism, segregation and economic injustice and then the busses and Rosa's arrest and the bus boycott. Lena gives this a 5 and I give it a 3, and so it gets a four. Rosa Park...I have never come across this name! I didn't know who was she, I didn't know what she is famous for, I didn't know anything until I found this little book! This beautiful book made me sad, very sad. I knew that the practice of racism in earlier times was really bad, but this! God! There used to be different water fountains for colored people and they had to use different lifts in buildings! They couldn't even sit on the first row of buses! How pathetic things were! Rosa Park was also Rosa Park...I have never come across this name! I didn't know who was she, I didn't know what she is famous for, I didn't know anything until I found this little book! Rosa Park was also experiencing these things from her childhood because her skin color and after a time she got tired of this discrimination. So she stood against these norms developed by the so called white people! Without thinking what may happen to her, she fought to bring the changes needed then! The most amazing thing about her was, she never raised her voice higher, she never quarreled, she didn't cursed others! She was calm and quiet and she knew very clearly what was she doing and yes, her efforts brought rays of hope in the life of the discriminated people! "Always stand up for yourself." At a young age Rosa Parks was taught to not only respect others, but also respect herself. Respecting one's self is empowering. It is something that helped Rosa in standing her ground, and standing up for herself when she wasn't being treated fairly or with respect. It proved vital in her powerful stance for change during a time of segregation in our country. She is an example of how one person can make a huge impact in a world that is afraid of change. She peacefu "Always stand up for yourself." At a young age Rosa Parks was taught to not only respect others, but also respect herself. Respecting one's self is empowering. It is something that helped Rosa in standing her ground, and standing up for herself when she wasn't being treated fairly or with respect. It proved vital in her powerful stance for change during a time of segregation in our country. She is an example of how one person can make a huge impact in a world that is afraid of change. She peacefully stood up for herself, and the fair treatment of others. Her refusal to give up her seat sparked a movement, and changed the rules of segregation in her town. Though change didn't happen right away, it did happen. Rosa Parks is proof of how one person can inspire others, and bring about change. She's proof that no matter what, always stand up for yourself, and what you believe in. No matter how many times Rosa Parks was told no, or treated unfairly, she never let that get her down. She stood unmovable. She stood strong for what's right. I have always admired the courage and bravery that Rosa Parks had. Not just to defy the law, and what society at the time deemed acceptable (which it wasn't), she stood for what Thomas Jefferson long ago wrote, that we're all created equal. Rose Parks is an incredible example of how an ordinary person can do extraordinary things. Like every book in this fabulous series, at the end of the story is a quote, along with pictures, and facts about this incredible person! This is another fantastic book to pick up and add to your personal, classroom or public library. So, just like I am Helen Keller, I read I am Rosa Parks for my PopSugar 2015 Reading Challenge. This time I was not as surprised at how adorable it was, because I had already read I am Helen Keller, but it was still uber cute and very informative. Seriously, if you have kiddos, these are great little books about important figures in history. I would seriously recommend them! I LOVED this book! I am Rosa Parks is the wonderful biography told in kid friendly language about the brave Rosa Parks and the events that led to the Montgomery Bus Boycott and the Civil Rights movement for equality and desegregation. It is told from Rosa Park's point of view. It is a blend of graphic novel with narrative and at the end of the book it has real life pictures. I loved how it tells us about Rosa Parks and her various incidents in her life and how she stood up for herself in a very I LOVED this book! I am Rosa Parks is the wonderful biography told in kid friendly language about the brave Rosa Parks and the events that led to the Montgomery Bus Boycott and the Civil Rights movement for equality and desegregation. It is told from Rosa Park's point of view. It is a blend of graphic novel with narrative and at the end of the book it has real life pictures. I loved how it tells us about Rosa Parks and her various incidents in her life and how she stood up for herself in a very respectable manner. This biography explains segregation with pictures, which is always very interesting to see how not long ago, things were not the same as they are now. This is an inspiring biography about fighting for your beliefs and making a difference! This book is great for children in grades 3-5, it could be used in grades beyond that too. I am Rosa Parks is great for a real aloud and to have a wonderful class discussion after reading. It can be read during Black History month, while reading about civil rights activists or just at any time of the year if you want to inspire and read something that is part of our history. I am Rosa Parks by Brad Meltzer is a part of the Ordinary People Change the World series. This biography, along with the others in the series, is an engaging way for children to learn about the history and lives of people who have had such an outstanding impact on our world today. This is a wow book for me because of the way it is written in a friendly, conversational way. This really bring the books to life for younger children. 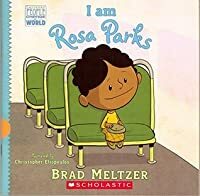 I purchased this book through Scholastic for my classroom library a I am Rosa Parks by Brad Meltzer is a part of the Ordinary People Change the World series. This biography, along with the others in the series, is an engaging way for children to learn about the history and lives of people who have had such an outstanding impact on our world today. This is a wow book for me because of the way it is written in a friendly, conversational way. This really bring the books to life for younger children. I purchased this book through Scholastic for my classroom library and so many of my students have gravitated towards it. My students have shown interest towards this book because of the way it seems similar to a comic book. While reading this book, students are always eager to share some new and interesting facts that they have learned about Rosa Park’s life. Students also love to contrast how her life is different from our life today. This is a wonderfully written biography about Rosa Parks that I would read to my 4th and 5th grade students. This book does a great job of encapsulating and informing all ages of readers in the admirable life of Rosa Parks. It accurately and appropriately displays the struggles she and many others underwent during that time due to the color of their skin. Not only is this book well-written, but it is also beautifully illustrated. The images in this book do a great job at showcasing the hardships This is a wonderfully written biography about Rosa Parks that I would read to my 4th and 5th grade students. This book does a great job of encapsulating and informing all ages of readers in the admirable life of Rosa Parks. It accurately and appropriately displays the struggles she and many others underwent during that time due to the color of their skin. Not only is this book well-written, but it is also beautifully illustrated. The images in this book do a great job at showcasing the hardships African Americans faced during the Civil Rights Movement. To finish it off, there is a simple timeline in the back of the book that could be used as an instructive tool or just to summarize the events you just read about in the book. -What motivated Rosa Parks to refuse to give up her bus seat? -How did Rosa Parks’ actions contribute to the Civil Rights Movement? -If you were Rosa Parks, what would you have done when told to move to the back of the bus? Why? -Do you think that activists like Rosa Parks are important in fighting injustices today? Do you know of some other leaders like her? -What impact did Rosa Parks have on todays society and the way we treat people? -How could you be an activist like Rosa Parks? Then I might have my students do a quick-write about how Rosa Parks has inspired them to stand up for what they believe is right and why. You could even use this as a form to teach comprehension strategies. For example, throughout their reading they could also be writing down some questions, thoughts, or inferences they might be making while reading. You could also have your students reflect on a time when they felt they (or someone else they knew) were excluded on an unfair basis and why. Then, they can place themselves in the role of being an activist, just like Rosa Parks, where they write a letter to the person or organization responsible. They could also write a poem addressing how they felt. In addition, you could turn this into a Social Studies lesson where you discuss what civil rights are, who has access to them, how they are protected under the law, and how Rosa Parks made a change in the law by refusing to give up her seat on the bus. As part of @BLMAtSchool week I am reading "I am Rosa Parks" to my K-2 students. Part of the Ordinary People Change The World series, each book tells and engaging story of one of America’s icons in a way that works well for the youngest nonfiction readers. A great segue to the Who Was biography series. This series is the perfect way to bring American history to life for young children, providing them with the right role models and inspiring them to dream big, because each of these hero's started of As part of @BLMAtSchool week I am reading "I am Rosa Parks" to my K-2 students. A picture book biography of Rosa Parks, one of the books in the Ordinary People Change the World series. The fact that Rosa Parks looks like a child throughout the book, even when she has grown up, is confusing. The use of first-person narration as well as the invented dialogue place this book in an odd hybrid category blending fact with fiction, perhaps most appropriately labelled as historical fiction rather than biography. This is a biography written as if Rosa Parks was telling her story herself. This book tells her story while also telling the story of segregation. The story describes the different drinking fountains, schools, etc for the different races and then talks about what Rosa Parks did for people of her race and what it resulted in. I thought this book was very well written in a way that kids would be able to understand without getting frightened of that time. I think it also did a very good job explaini This is a biography written as if Rosa Parks was telling her story herself. This book tells her story while also telling the story of segregation. The story describes the different drinking fountains, schools, etc for the different races and then talks about what Rosa Parks did for people of her race and what it resulted in. A lot of words for Ingrid, and I simplified some. But she really liked it. She fixates lately on people who are mean, so she wanted to read certain pages over and over. Hard for me to explain so many times, but I know she's trying to grasp the idea of racism when she does this. Got goose bumps reading this. Sparked an important conversation with my 4 & 6 year old. In this biography of Rosa Parks, she explains the differences in how blacks and whites were treated during the time she was growing up. She begins with experiences from her childhood when she was blamed unfairly for things solely because of the color of her skin. Then she moves on to talk about two different instances where she was treated with disrespect on the Montgomery city bus because she was black. These parts of Rosa Parks' life demonstrate the cruel reality of how segregation divided our country at this time. I would most likely use this book in a 3rd or 4th grade classroom, although I believe it would be appropriate for 5th graders as well. One way I would incorporate this book into a lesson in my future classroom is by having my students choose an African American historical figure who made a positive impact and create a picture book telling the story of their life and how they made a difference. This is a book/activity I would be likely to introduce during Black History Month to highlight its significance. Another way I would use this book in my classroom is by having my students create a biography of someone in their life (family member, friend, etc.) who has made a positive difference. I would have them find ways that the person they have chosen has stood up for what was right (even if it's something small!). I think that this would be a particularly great activity because it shows students that anyone can make a difference and heroes are all around us, not just famous figures! Then each student would share with a partner and I would ask them to discuss similar traits in the people that they selected (e.g. brave, determined, empathetic, etc.). *Both have strong female characters. *Both are set in the 1950’s South during the time of the Jim Crow Laws of discrimination. *Both reveal the pain of discrimination. *Both reveal strength in the face of hardships. *Chronological Order: Tells the story of Rosa’s life and provides a timeline. *Cause and Effect: Clearly tells how the actions (causes) of some effect the lives of others. *Problem and Solution: It takes much hard work, sacrifice, and many years, but solutions do come. *Question and Answer: Answers the when, how and why of Rosa and Ruth’s lives during the 1950’s. *Before the reading, discuss historical fiction vs. nonfiction and record a list of characteristics of each on an anchor chart for future reference. *Before the reading, discuss "cause and effect" explaining cause is the first thing that happens and effect the second thing that happens. *Throughout the reading stop to ask: What happened here first? What happened second? *After the reading, guide students to research for more facts about the 1950's, the 1960's and The Civil Rights Movement, famous people during that time frame, etc. I love the way this story is told. The illustrations are great and I really think young kids will be inspired to stand up for themselves and what they think is right. I want to read the rest of the series! Excellent book about Rosa Parks! The book teaches kids to stand up for themselves when someone is mistreating them. 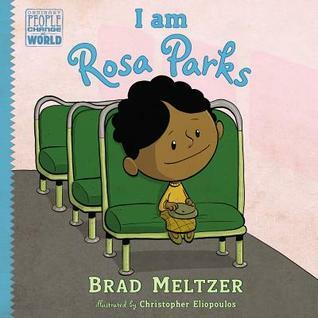 Brad Meltzer’s historical fiction, I am Rosa Parks, is a fantastic read for children. He explores the important facts that illuminate racial inequality in Alabama during the early to mid 1900s. As a child, Rosa Parks was taught to respect herself and to expect respect from others. Although she grew up during a time of racial inequality, that did not stop her from standing up for herself. If she was pushed by another child, she would speak her mind, even if the boy was white. The book discusses how people of color had to use different water fountains and attend different schools in comparison to white people, which Rosa Parks was not in agreement with. One winter day, she was kicked off a bus just for entering the front door. She knew at that moment that she had to fight for equal rights and decided to join the National Association for the Advancement of Colored People (NAACP). Her most memorable moment was when she refused to give up her seat to a white man, which lead to her arrest in 1955. She continued to stand up for herself and others as she started the Montgomery Bus Boycott which later lead to the U.S Supreme Court ruling of bus segregation as unconstitutional. Like many people of my generation, I first learned about Rosa Parks thanks to the rap group Outkast. And while some people were offended by the reference made in that song, it squared with my own experience riding the bus in high school in one of Tampa's more ethnically diverse neighborhoods where almost all of my neighbors were black. (Note: I am not.) Rosa Parks is considered a hero essentially for one act, and that is refusing to get up from her seat in the bus. During the time, blacks w Like many people of my generation, I first learned about Rosa Parks thanks to the rap group Outkast. And while some people were offended by the reference made in that song, it squared with my own experience riding the bus in high school in one of Tampa's more ethnically diverse neighborhoods where almost all of my neighbors were black. (Note: I am not.) Rosa Parks is considered a hero essentially for one act, and that is refusing to get up from her seat in the bus. During the time, blacks were forced to sit in the back of the bus while whites got to sit in the front of the bus. During my time in high school, many of my black high school neighbors wanted to sit in the back of the bus, something which is perfectly fine. To do by choice what one had to do by law or rule is not a problem. It is the act of having chosen that place that makes it okay. This is a rare sort of heroism that the author discusses that can be copied nowadays, and the author makes sure to reference buses in Alabama now to contrast the present situation from the past. Brief Book Summary: Rosa Parks talks about experiencing racism growing up, starting from her childhood to how she started the Montgomery Bus Boycott as an adult. She tells the reader that she was taught to respect herself and she deserved the same right as white people. I agree with both reviews that this book lacks credible sources and reliability. However, the illustrations indeed do make it easier for young readers to understand the content like both reviews pointed out, so it is hard to determine the value of the book. Children would probably enjoy the story and illustrations, but teachers must be careful about how they use this book as an instructional tool. The book’s cartoon illustrations make the story more appealing to children. Rosa Parks’ head is rounder and her body is significantly smaller than the rest of the characters in the book. This was done on purpose to attract the reader’s eye and convey her importance. Who says biographies are inaccessible old stuffy stories read only by adults? "I am Rosa Parks" is a lively, engaging story aimed at elementary school readers. If more of these existed when I was a child, I might have developed the habit of reading biographies instead of fiction. The story captures a time different from today and should be read with the supervision of adults to explain the differences, why things changed, and how we work on making the changes stick. This is very much a HISTORY boo Who says biographies are inaccessible old stuffy stories read only by adults? The story captures a time different from today and should be read with the supervision of adults to explain the differences, why things changed, and how we work on making the changes stick. This is very much a HISTORY book. One, the ongoing "hooray, less school - school bad" found so often in children books. I don't think this attitude should be endorsed or pushed - children will develop it on their own if the adults are not doing the education thing right. The story lightly touches on the kids having to work when not in school. If teaching with the book, I highly recommend making the children aware of why child labor laws exist and what children did before school was a thing. Only five months of school meant seven months in the fields. Two, the initial story from Ms. Parks childhood to get the young readers to identify with her with her being pushed and then "I pushed back", may be problematic, especially if the child(ren) being read to already has an issue with physical confrontation. Again needs supervision. So much context for this book is not available to today's child. I don't know if this subject can OR SHOULD be made accessible to young children who don't really see color. By fifth grade though, totally needed. A challenge is finding ANY biographies on females and/or blacks. But this twelve book series on "ordinary people" is changing some of that. Seven of the books are biographies on females, and six are people of color. I Am Rosa Parks by Brad Meltzer is a biography. I would use this book in 3rd grade as a read aloud, and in 4th and 5th maybe have the children read it independently depending on where they are at. It is heavy material because she was kicked off buses and treated differently because her skin color. One way I would use this in my classroom would be to talk about always treating each other well. Not bullying each other based on who they are or any reason for that matter. I think this could also be I Am Rosa Parks by Brad Meltzer is a biography. I would use this book in 3rd grade as a read aloud, and in 4th and 5th maybe have the children read it independently depending on where they are at. It is heavy material because she was kicked off buses and treated differently because her skin color. One way I would use this in my classroom would be to talk about always treating each other well. Not bullying each other based on who they are or any reason for that matter. I think this could also be used to motivate students to be change agents. Rosa Parks made it known that she was just an ordinary person, but also that there was no such thing as an ordinary person because we are all extraordinary. We have the power to make changes and to fight for what we believe. Teachers might also use this to lead into teaching about the way people were treated then versus now, and maybe even opening up a discussion about similarities and differences of then versus now. This book was a wow for me because I learned so much. History isn't always easy to learn because it is sometimes hard to put yourself in their position but I felt like with the combinations of the pictures and the story line I was able to picture being on that bus, and how hard that must have been for her. I also had heard the story before but either was told wrong, or had heard bits and pieces and put it together in my head, but either way, it was in correct. I learned so many details from this book that I didn't know before, and I would definitely use this book in my classroom. She has a powerful story that can motivate so many! Summary: This book follows the life and struggles of Rosa Parks. The author includes a lot about the history of racism against African Americans. Rosa Parks is a woman who learned to respect herself, expect respect, and respect others at a young age. This book highlights the struggles that young African American people faced. It follows Rosa Parks all the way up to and beyond her famous city bus ride. PERSONAL RESPONSE: I feel that this book does a great job at highlighting many important aspects of racism while informing readers of the life of Rosa Parks. This book teaches children to stand up for themselves and to not be afraid to make a change to the norm, even if it is difficult. Rosa Parks is a huge historical figure, and this book makes learning about her life fun and easy. The story line is very memorable. ILLUSTRATIONS: The illustrations of this book are very cartoonish and comic-like. This gives children a sense of reliability to Rosa Parks. This book starts from the beginning of her life and shows how she got treated differently when she was younger. One time, a white boy pushed her over and she pushed back, but the mom yelled intensely at her because she was black. It then went through how there were different elevators, segregated schools, separate water fountains, and divided sections of the bus for those of color. It then told the story how she began to work for rights of those of color. It told the story of when she didn’t mov This book starts from the beginning of her life and shows how she got treated differently when she was younger. One time, a white boy pushed her over and she pushed back, but the mom yelled intensely at her because she was black. It then went through how there were different elevators, segregated schools, separate water fountains, and divided sections of the bus for those of color. It then told the story how she began to work for rights of those of color. It told the story of when she didn’t move for a white person to take her spot and she got arrested. She started a movement and went on to get honors and awards for her bravery. I loved how the author went back to experiences from her youth that shaped her story to be a civil rights advocate. I appreciated that the author also showed real pictures of Rosa Parks at the end, even including her mugshot. Another interesting part of the illustration was when on one page of the spread it showed how the colored school was dingy and old, while in contrast on the other page was the bright classroom for whites with a playground through the window. It would be great to read this book alongside talking about the Constitution and how everyone is created equal. I would show how America has made terrible mistakes in the past that we are still getting over. An activity that I could do is have students brainstorm what things they want to see changed in our world today. I could also have students create their own “I am” book about a character in history. This book truly reflected Rosa Parks life and how she was a big part of the movement for civil rights. Rosa grew up in Alabama and through her whole life she was discriminated against due to her color. She was not going to have it any more and she stopped using the restrooms, elevators and water fountains reserved for the color to protest in her own way. Rosa stood up for her self and her race when she was riding the bus one day and she would not give up her seat for a white man. Rosa sparked a This book truly reflected Rosa Parks life and how she was a big part of the movement for civil rights. Rosa grew up in Alabama and through her whole life she was discriminated against due to her color. She was not going to have it any more and she stopped using the restrooms, elevators and water fountains reserved for the color to protest in her own way. Rosa stood up for her self and her race when she was riding the bus one day and she would not give up her seat for a white man. Rosa sparked a boycott and from there grew the civil rights movement. Rosa was no longer going to allow her self or others to be discriminated against just because of their color. "I am Rosa Parks (Ordinary People Change the World)" is appropriate for pre-k to second grade students. This book is about Rosa Parks and her life. It talks about her childhood and the experiences she had. It talks about race as well, which is an important topic to speak openly about with children. Rosa learns to stand up for herself, and to fight for what is important. This book also explains what it was like for black people in America during segregation. I love This book has not won any awards. I love this book, because it covers history about civil rights from the perspective of Rosa Parks. Her life experiences helped to shape her into who she was, and her perspective is valuable and important to teach to young students. This book is easy to read, and entertaining as well as informative. This children's book tells the true and historical story of Rosa Parks and how she impacted the Civil Rights Movement. It begins with her as a child during the era where African Americans were discriminated and segregated. Rosa Parks struggles as a child trying to understand why her skin color makes her different from any other person. As she grew older, Rosa Parks slowly got tired of giving in to being treated poorly and one day stood up for not only herself, but other African Americans. Well i This children's book tells the true and historical story of Rosa Parks and how she impacted the Civil Rights Movement. It begins with her as a child during the era where African Americans were discriminated and segregated. Rosa Parks struggles as a child trying to understand why her skin color makes her different from any other person. As she grew older, Rosa Parks slowly got tired of giving in to being treated poorly and one day stood up for not only herself, but other African Americans. Well in this case, she didn't stand up...she sat. Her sitting was the start to many changes and helped start the Civil Rights Movement. In addition to his fiction, Brad is one of the only authors to ever have books on the bestseller lis Brad Meltzer is the #1 New York Times bestselling author of The Inner Circle, The Book of Fate, and nine other bestselling thrillers including The Tenth Justice, The First Counsel, The Millionaires, and The President’s Shadow. His newest book, The Escape Artist, debuted at #1 on the bestseller list.